EXCLUSIVE LISTING - ASSIGNMENT OF CONTRACT. Now offering a rare chance to purchase a brand new condo in Vancouver for under $300,000. 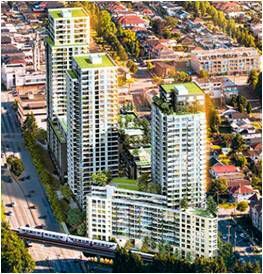 Wall Centre Central Park is poised to be the next largest community in the fast-growing Collingwood area with a coveted Vancouver address. Located close to the Joyce SkyTrain Station and directly across from Central Park, this urban oasis is prefect for the new home buyer or investor. This major development is also a few minutes drive to Metrotown Mall, the 2nd largest mall is Canada and only a few minutes drive to the future Brentwood Mall, the 4 largest in Canada when complete, located down Boundary straight to Brentwood, North Burnaby. Wall Centre Central Park will be targeting LEED GOLD certification, which is almost the highest accredation in "green" living and sustainability. The unit itself is a highly efficient and functional 1 bedroom located below the 11th floor terrace level. It is amost like being on the top floor because there is virtually nobody above most of the unit. CHN (Collingwood Neighbourhood House) Annex: Collingwood Neighbourhood House Annex features space for childminding, cooking classes, educational services and a theatre room.